For all those ladies who wish their hair would grow faster, or who regret a decision to go short, extensions are the solution. In a few hours, you can have the long hair you crave. But if you’re new to the world of extensions, you probably have some questions. Here’s our Extensions FAQ. How are hair extensions applied? Clip-in: The simplest method, for the short term. Tiny combs attach the extensions at your roots. Adhesive tape-in: Adhesive strips attach tiny extensions to your scalp. One of the quicker ways for both application and removal. Good for blondes. Sew-in: Also known as a weave. The stylist uses a needle to sew these extensions into your cornrows. They can take a few hours to apply, and last for up to three months. Popular for African American hair. Bonded: These long-lasting extensions, also known as fusion, are glued in at the root. Micro-link: Your stylist clamps tiny cylinders over your hair with pliers. Tied: Each extension, or weft, is hand-tied to your hair. A machine-tied option consists of thicker extensions. What are extensions made of? 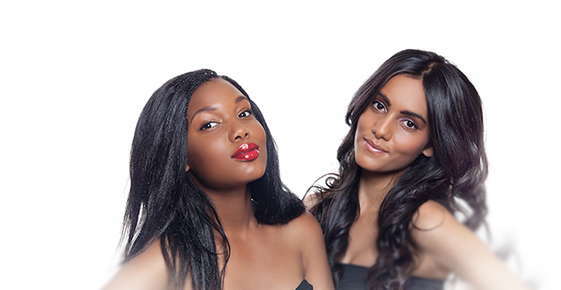 Extensions fall into two main categories: human or artificial hair. Human hair costs more, lasts longer and behaves more naturally, but artificial hair is great for a quick, fun change in style. You can dye and style extensions made from human hair. The highest quality type is called “remi,” which means the strands are aligned so they go in the same direction, cuticle to tip. This prevents tangles. Artificial hair can’t be dyed, and can, unfortunately, melt if you apply too much heat. But it’s available in all types of colors, from natural brown to neon green, and in many textures. How long can I wear extensions? The durability of your extensions depends on whether they’re natural or synthetic, and how they’re applied. Your styling choices and hair growth speed also affect the longevity of your extensions. Most extensions need to be redone every six to twelve weeks. Bonded extensions may last up to five months. How do I take care of my hair extensions? Brush your extensions regularly to keep them tangle-free. Braiding them loosely while working out or sleeping can help them last longer. Be sure to avoid oily products, which can make extensions slide. Too much heat at the bonding site is also a no-no. Extensions are so fun for changing up your look. We love to help our customers try something totally different. Call us today and together we’ll dream up a long-hair look just for you.